… at least I can have an exceptional injury. 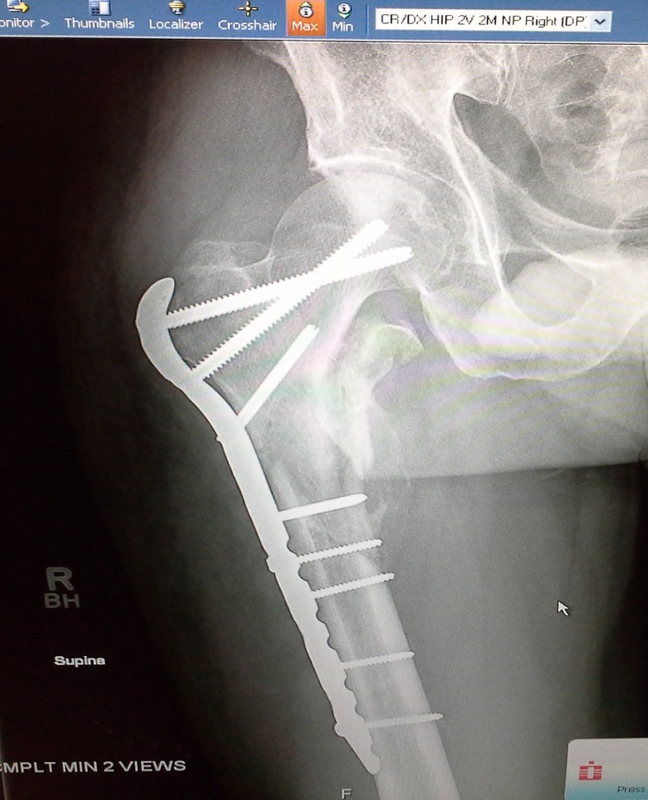 Above is the most recent x-ray (as of today) of my repaired femur, complete with stainless steel plate and screws. I got a brief look at the x-rays a month ago, but didn’t take a picture that I could save and look at. The screws are a lot longer than I remember. There have been times when I swear I can feel the plate and the screws but am not sure if that’s just my imagination getting the better of me. Now I have a real visual. Early on I didn’t care to see pictures. I knew it was bad, and I didn’t want to be further haunted by the image of how bad. But once things started to heal and progress, I wanted to know. I asked the doctor to show me where the break was. “Breaks”, he said. He pointed out the multiple places where it had broken. That piece below the hip that’s near the pelvis? That is a piece that’s broken off. He said he tried to pull it in with a screw but gave up because it was “a bunch of mush in there”. I’m glad I didn’t hear that 7 weeks ago. The good news is that there is evidence of bone growth, and things are generally progressing as expected. Which unfortunately means still another 4-5 weeks before I can start putting any weight on it. But maybe the next time I post one of these pics I will be doing it with both feet on the floor. Friday evening I was torturing myself, looking at Ernesto’s pics from the State Track Championship. I think that’s one sign that I’m getting better: pictures like that are giving me “the itch”. Saturday I was determined to get out of the house and do something … normal. Since coming home from the hospital on May 13, aside from sitting on the patio, I have been out of the house exactly 4 times. Once to the doctor, once for a haircut, and twice to the massotherapist. It sometimes feels like the world is spinning along at normal speed, and I am stuck in an alternate universe that goes in slow motion. I wanted to go watch Saturday’s track races, but it seemed too much logistically. Get my hair cut again? They were super busy. 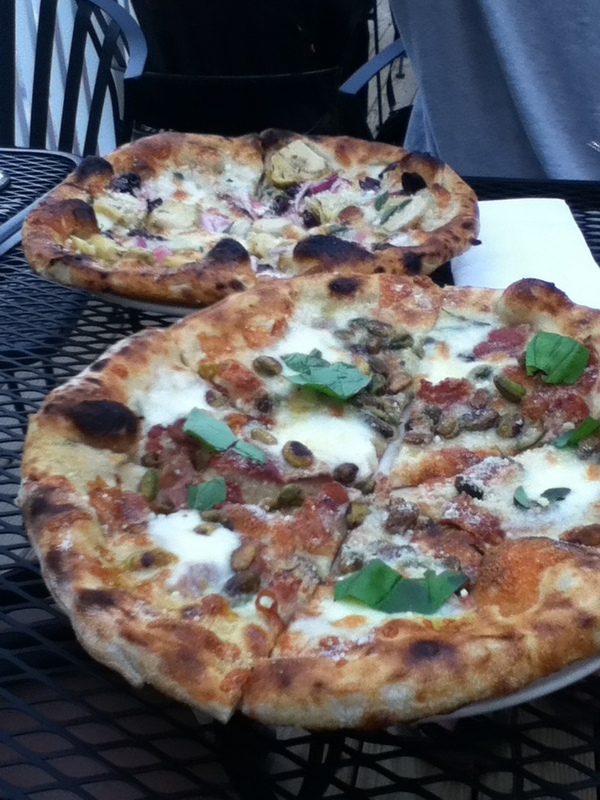 Next, and best option: get my son to take me for pizza and beer at Biga, up in Kirtland. I’d been there quite a few times, but never paid attention: were there steps to get inside and/or to the outdoor deck? No way can I navigate steps yet. I called to confirm. They have a ramp. I’ve come to appreciate, first hand, what businesses now do for “accessibility”. Driving there was an interesting sensation after being stuck at home. Everything so familiar, but at the same time so stimulating to see something other than my immediate surroundings. It didn’t even matter where we were going. It was enough to just be out and going somewhere different. The bonus was getting great pizza. 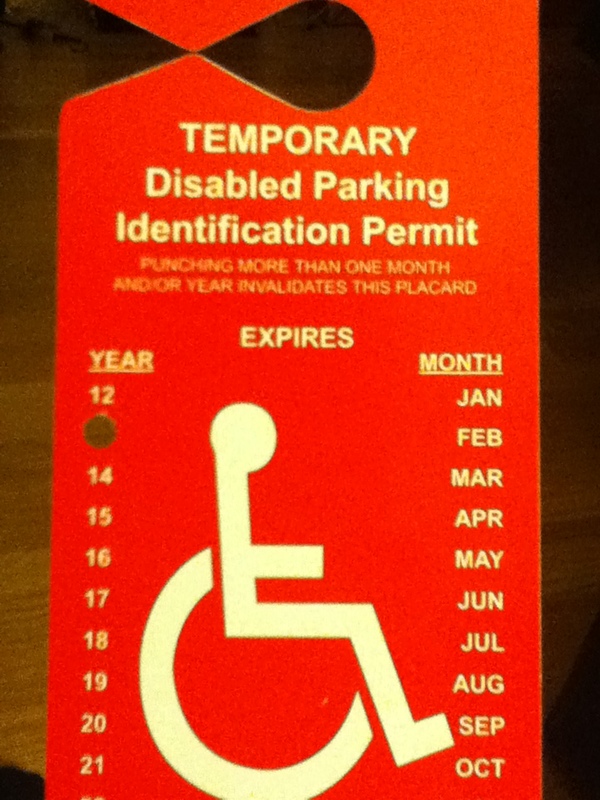 Postscript: checking the mail when we got home, I get to park in the close-up spaces from now til December. About 10 years ago I was having some shoulder and back soreness and went to see a guy who did trigger point therapy. Surprisingly, he didn’t focus on my shoulder. My problem was one or two joints away from the shoulder, he told me. The shoulder was the effect but not the cause. When one area is out of alignment, it throws everything else off. At the moment, my main problem is the broken leg. But it’s also messing up other things: my shoulders and upper arms are now sore from using the walker and crutches. It’s gotten bad enough that I went to see a massotherapist to help get things lined up again. It occurs to me that this is also a metaphor that applies more widely. People tend to think that when you ride so much, you must be really healthy. I’ve often joked that, yeah, I’m fit for cycling but I’m not sure it’s healthy. I’ve actually felt more healthy overall in the winter, when I’ve mixed cycling and running, and the training intensity is less. Sitting here now, having gone 6 weeks without riding, it seems quite obvious that what we do is out of balance. This isn’t a new thought for me. Back in late 2001 — and I remember this clearly — I finished reading a book by the Dalai Lama, and concluded that bike racing was an addiction not unlike other addictions. Sure, it’s better than substance addiction, but it still seemed clear that from a psychological (or spiritual) perspective it was an addiction. I thought about dialing back the racing, and wasn’t sure how much I would race in 2002. But then it seemed that just recognizing the addictive quality was enough. I knew that I wasn’t going to race forever, and wanted to do it while I could. If I recall correctly, I had a pretty good year racing. Right now, I am out of balance again, in more than one sense. In addition to the physical issues, I’ve gone from being super-active to mostly-sedentary, spending way too much time in front of an open laptop. From one extreme to another. I think I need to go find and re-read that Dalai Lama book. PS. The movie that is referenced in the YouTube clip above is worth watching. Not sure how available it is these days. On more than one occasion I’ve wondered whether anything I did as a father made any real difference. Mostly that happened around the time my kids transformed into that unpleasant creature called “teenager”. When they were self-absorbed, made decisions I didn’t like, seemed unappreciative and ungrateful, I sometimes thought “why do I bother?” Why continue doing for them when a. it doesn’t seem to make a difference, and b. you often just get grief in return. Then I would remind myself: you don’t do this because you expect something in return. Yesterday — the day before Father’s Day — I got a card in the mail from my daughter who is away at school taking summer classes. I wasn’t expecting it. She wrote that she recognizes and appreciates that I’ve supported her in “every single thing that (she’s) done in her life”. That is of course the best Father’s Day gift that I could hope for. So, parents of (current and future) teenagers, there is hope. Keep doing what you’re doing. I figure at some point I have to again write about something other than having a broken leg. WordPress, which is what is used for this blog, has a “dashboard” feature that shows things such as how many page hits there have been each day, what are the posts with the most recent activity, and what were the top searches that brought someone here. Those last two are consistently interesting. The latest, most bizarre search that brought someone here is, “why don’t I die like normal people”. I thought that maybe it’s a song lyric or title, but it doesn’t appear to be. I can only imagine what that person was really looking for, but I’m guessing it wasn’t this site. Under the recent Top Posts, a post on “How I Came to Love Cross Country” continually shows up, even though I wrote it way back in 2011. I wish I knew how people are managing to come to that page. That post happened to catch my eye because my daughter sent me a text last Friday evening that said, “NCAA women’s 10k is on. Kayla is running”. Kayla was one of her roommates at school last year who blossomed into a runner (CC and track) good enough to be in the NCAA outdoor track finals for the 10,000 meter event. I pulled up the live stream and watched, thinking how amazing it would be to be competing in an event like that, on Oregon’s track where so many great runners have trained and competed. I noticed my heart beating faster as the race developed, like it did when watching those cross country meets. So yeah, I guess that post is still apropos. If I look at the bigger picture, and compare where I am today to where I was the day I came home, it seems a lot better. Four weeks ago I could barely bend my knee, struggled to get out of a chair and into and out of bed, and needed someone to get me important stuff … like coffee. I’ve been out to the doctor, out for a haircut, out to the end of the driveway to watch the neighborhood Memorial Day lawn tractor races (that was my race experience for Memorial Day). That list would be quite depressing if I don’t compare it to where I was initially — and even more so to when I couldn’t get out of bed in the hospital without passing out. It’s hard to project where this rate of progress will take me. But I don’t have much of a choice, so I’ll have to take it. I’m hoping I can get out to at least *watch* a race this year, which will be enough for the moment. If you’re going to do something that’s part of your pre-race routine, you might not want to do it when you’re unable to race. That is what caused my first little “meltdown” the other day. I think most racers have something they do before the race that, for whatever reason, puts them in the racing zone. For some, I think it involves the stress of arriving at the last minute and pinning on a number just before they blow the start whistle. For many others it involves listening to some kind of music. I’ve got a number of playlists that I listen to while on the way to races, depending on what kind of mood I’m in. I hadn’t listened to any of those playlists in the last 5 weeks. Without thinking much about it, I played one the other day. It brought on this unexpected flood of memory and sensation of racing — getting there, getting prepped, racing, the intensity, the whole scene. And then the visceral recognition that I’m not doing it, for a long time. Someone who has not engaged deeply in an activity — whether bike racing or something else — may not fully appreciate this. Once you start racing and get hooked, it gets into your blood. It’s hard to just ‘casually’ race. If you try that you’re likely going to be spit out the back and doing your own private training ride (to quote Brad Hansen). So racing becomes an all-consuming and somewhat obsessive activity. Suddenly take that activity away, when you’ve been doing it for a long time, and it leaves a hole. I think that finally registered with me. It’s interesting to me that music triggered this recognition. Interesting, but not too surprising, as I’ve read about this previously, e.g., like here. I’m thinking that I’ll be able to use this to my advantage too, once I’m able to start some real physical therapy. It worked once already: the PTs in the hospital had me blast some Chili Peppers to get me off the bed and using the walker for the first time. Quite a scene.